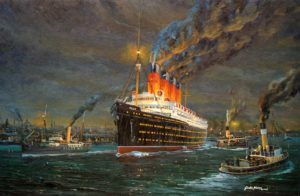 Page and ‘Further Reading’ page completely revised and updated, visit, Mauretania, Cunard Liner, a good read, enjoy. Original long since sold, still in print, [original sold] a very few copies left, signed, limited edition. Mauretania a popular ship distinguished herself as fastest liner on the oceans. If you have a comment on the above please visit Contact Us. To have your comment posted here please give us permission. Update re: petegossprint mini web site and 'page 3'. This entry was posted on Wednesday, February 6th, 2019 at 11:19 pm	and is filed under diary, Marine prints. You can follow any responses to this entry through the RSS 2.0 feed. Both comments and pings are currently closed.